Are you fond of accomplishing do-it-yourself activities at home? 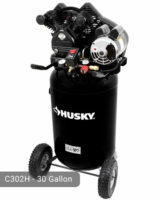 If yes, you probably need Husky 4 Gallon Wheeled Stack Tank Compressor. 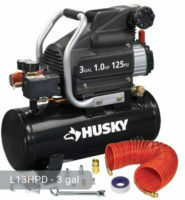 The motor of this Husky 4 gallon air compressor runs at 1.5 HP that is perfect for your list of home projects including framing, hobby painting, blow cleaning, air brushing, and inflation of vehicle tires or gym equipment. The receiving tank of this machine can accommodate 4 gallons of air delivery. It is made of durable steel for long-lasting protection. Because you will be using multiple tools for your tasks, the tanks were designed to have a twin-tank configuration which can power multiple tools. These tanks fill very quickly making your tasks faster to finish. Two air outlets are available where you can plug your pneumatic tools such as finish and framing nail guns. The pump is oil-free which means that you do not need to perform maintenance activities that will make your busy schedule more hectic. Also, you need not worry about oil leaks and residue which make your workplace messy. 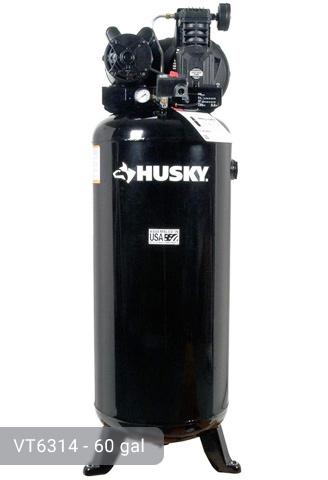 The maximum pressure of the Husky 4 gal air compressor is at 155 psi. This is not appropriate for heavy industrial purposes but is more than enough for domestic uses. It can deliver 2.8 SCFM AT 90 psi for simultaneous powering of your tools. It has a tank pressure gauge so you can closely monitor the level of air pressure that is being delivered. 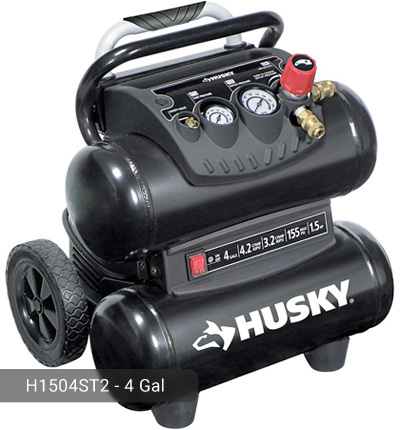 Husky 4 gal air compressor can be transported easily because it has plastic wheels. It is light (weighs only 44 lbs.) and compact so you can move it around on all types of surfaces. In addition, it has a telescopic handle that lets you hold the compressor more conveniently. An additional feature of this air compressor is that it has an on-board storage where you can place your accessories, nail gun, and hose. This model is not the quiet type. However, the sounds that the air compressor creates while operating are tolerable. It is also not as loud as massive compressors. It has an automatic shut-off feature which turns off the motors when the maximum pressure is reached. This is a very important function to avoid overheating and burning the pumps and motors of the compressor. You can easily use the tool by plugging it into a 120-volt electrical power source. It is safe to use because the power cord is long enough to keep you a good distance from the outlet while working. It is user-friendly and can be manipulated by anyone who is familiar with the machine. 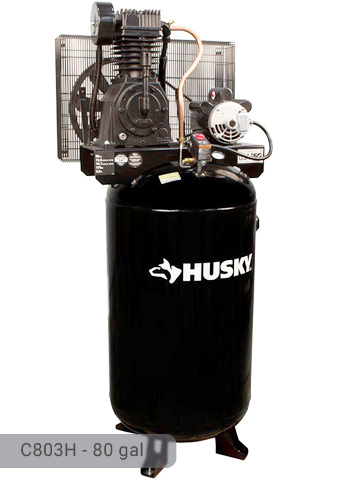 Husky 4 Gal Air Compressor was manufactured mainly for light-duty tasks. Do not expect that you can use it for heavy tasks such as grinding. Compared to other brands, this one stands out because not all 4-gallon air compressors can simultaneously power multiple tools such as two roofing guns. If you need to have a good partner in doing all your projects, make sure to check this one out when you visit your local home store. If you already own Husky H1504ST2 model or just want to buy it, feel free to share your review or ask a question through the form below.